Dataman Aarogya is a NABH compliant HIS software that helps in easy management of multi-specialty hospital software, nursing home, polyclinic, medical shop, pathology and radiology labs. Dataman Aarogya is a super-specialty software provides excellent services and solutions across the Healthcare Industry with integrated health management system which assists them in the critical needs of the hospitals. Dataman Aarogya helps safeguard the flow of information coming across and provides for efficient decision making of general hospital management, streamlining financial accounts and patient care. Dataman Aarogya solution is modular and gives healthcare organizations the convenience of a flexible rollout strategy. Founded in 1990, Dataman Computer Systems Pvt. Ltd. is involved in the development of software solutions for businesses. The company is headquartered in India and has been in business for more than 27 years. Dataman is renowned for its business solutions such as health care ERP – Aarogya, hospitality ERP – Aatithya, construction ERP, educational ERP, GPS location tracker, and several more. The company also offers other services such as software development, web development, IOS development and android development. The Outpatient module serves as an entry point to schedule an appointment with the Hospital Resident Doctor or Consultant Doctor for Medical Consultations and diagnosis. This module supports doctors to take better and timely consultation decisions by providing instant access to comprehensive patient information. The inpatient module is designed to take care of all the activities and functions pertaining to Inpatient Management. This module automates the day-to-day administrative actives and provides instant access to other modules, which leads to a better patient care. The Diagnostics module automates the investigation request and the process involved in delivering the results to the concerned department/doctor of the hospital. Diagnostics module starts with receiving the online request from doctors and also allows Diagnostics personnel to generate requests. Inventory module deals with Purchase of Items, Issue of Items, Maintenance of Stock, Automatic Reorder level Setting, Online request for stock from various sub-stores, Online stock transfer, maintenance of stock at different sub-stores, Physical stock verification and adjustment, Return of items to supplier etc. 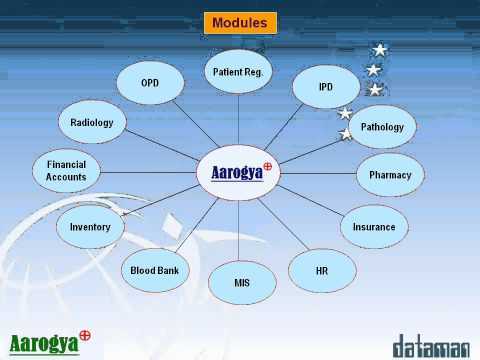 An integrated Hospital Management Solution "Aarogya", which addresses all the major and minor functional areas of modern multi-specialty hospitals. Dataman "Aarogya" enables better patient care, patient safety, efficiency and reduced costs. It provides easy access to critical information there by enabling the management to take better decisions on time.